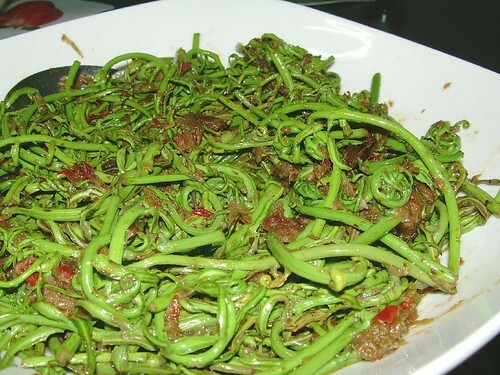 Your belacan midin really makes me drool….really can’t wait to come home this May….I really miss that wild vege so much..
me too…so long never had taste of this Veg….miz so much! Hi. You’ve just been tagged again! Faster faster thank me for the filler posts. Hehe. Have not seen this veg before. What makes it pesticide-free, do you know ? Reminds me of my distant youth when my mother used to buy sayur paku from the kampung baru market in KL. We usually had it in a coconut based light gravied fried veg dish with sambal usually with small prawns. It was supremely delicious and even more so in my memory!! 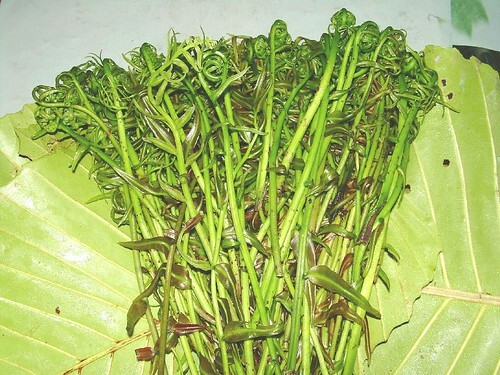 Think it is referred to as “fiddleferns” which is randomly harvested from the wild in other parts. Certainly not cultivated for consumption. Wah..this one DAMN HOCHIAK! I had it once in KL..only once, some tai chow place was offering it and my dad ordered it cos he used to have it in Kuching all the time while he was working there in his younger days. I also haven’t seen this fern before. Maybe is a local Malaysian vege? Cynthia J : I remembered you spoke about the miding before I left for Kuching for the CNY holidays. Yeah, it’s one of my must-haves when I go back to Kuching. mspretty : Fancy going to Kuching to have this veg??? LOL! mumsgather : Thank you! Thank you! tigerfish : I think it is not commonly found and bam just answered your next question. may : It looks similar to fiddle ferns but I don’t know if it is exactly the same as there are so many types of ferns. 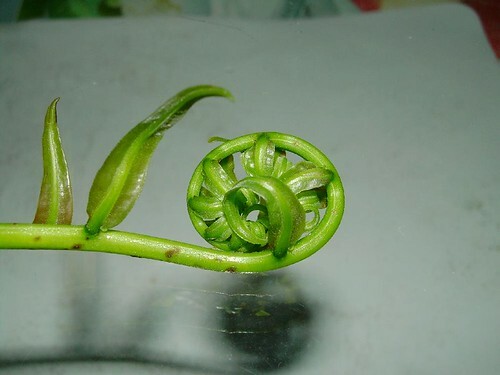 Perhaps, paku miding is slightly different from the fiddle ferns. The latter is quite commonly found in Malay cuisine. Food-Fusion : You are lucky to have tried it in KL. Something of a rarity nowadays and hence, the increase in prices. simcooks : Perhaps it is. Haven’t done enough research by myself. He! He! i miss eating midin. i remember visiting kuching and almost every day, we order midin! i even bought midin back to Singapore! actually colleague at work whose from kuching says another species of it can be picked from the jungles here. hehe.. things pple do to get what they want to eat. This just remind me when I followed my mom to pick miding nearby our house, we used to stay in sri aman for 2 years when I was a little girl. I dont think miding grows in Peninsular M’sia soil though..
Oh, that just looks wonderful. So pretty – like our fiddlehead greens. Jennie : I’m afraid I’ve not come across them in my grocery shopping trips in KL so far. I get them from Kuching when I go back to my in-laws. Perhaps I should start a business selling the paste eh? Where can I get paku miding? i’ve not seen midin in peninsular malaysia. only available in borneo as i’ve been told. waa.. really miss this pucuk paku. for those this tryring to find it maybe u could try in pasar malam Taman Medan, PJ. i saw it last time.The makcik told me that the pucuk paku was brought from kelantan.Peninsular also have dis paku miding, but people prefer the another pucuk paku which is pakis perak. but i prefer this one. really not sooooo easy to get this one in KL and selangor. but we have it a lot in Johor. OoH..go to Pasar Malam in Serdang. They do sell miding, but what a miserable bundle of fully open laddle-heads. Well, can simmer down my once-in-a-while cravings, although not as nice as the still curled laddle-heads midin. We do have some farms cultivating this midin in Sarawak a few years ago. But nothing beats the thrill of hoisting my ‘tambok’ (dayak basket) and scouring the bush and shrubs for this delicious sayur. We stir-fried them in belacan, yes, and add in oyster mushrooms, the brown fungus all freshly picked from the wild! midin is so delish.it’s available here in kl but u got to pick (mutit) it yerself.keep a sharp eye for the red tips of the midin along the roadsides near peaty areas.a buddy picked one big ‘nyiru’ -rattan container of the stuff along the kuala selangor road.i think i’m going midin picking this weekend.craving man…..
Was looking for recipe on turnips and found your recipe which is very close to my mum’s. I have just retired and beginning to be interested in cooking. Hence regret did not take much notice of mum’s cooking. Thank u so much for your interesting website,which makes me feel very nostalgic as the recipes of most of the dishes reminded me so much of my mum, who has passed away.